It was really only a question of time before someone developed a fashionably-designed solar-powered bike light. Owleye Solar Headlight is the name of this Taiwanese wonder. 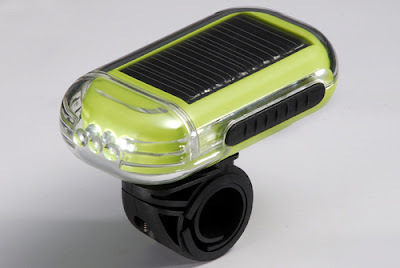 While many bikes, here in Denmark anyway, now come equipped with Reelights or cheaper equivalents there must be many people who could benefit from using the detachable solar light in their outdoor pursuits. It's lightweight [80g], water-resistant and suitably bright. You get up to eight hours of run time [16 hours in flashing mode] when fully charged. In a hurry? Three hours of full sun charging gives five hours of full light. Just leave it in the window sill when you're not using it and it is always ready to go. 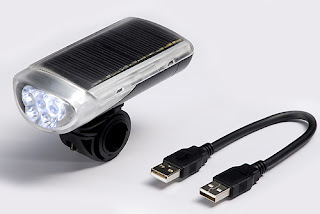 There is also a model that comes with a USB Quick Charge function, so you can supplement the solar rays with energy from one of your computer's USB ports if you're really in a hurry. The lights are in distribution in Europe - we heard about them in Sweden - and the company's website has some info as to where you can get them in Europe here. Not surprisingly, the very cool Mountain Equipment Co-op in Canada is ahead of the game and they sell them for $19.50 on their website.